Suzanne Birner and Katie Kumamoto have been named the 2016 Harriet Benson Fellows. This award honors exceptional scholarship and research accomplishments by graduate students in the Department of Geological Sciences at Stanford University. The award was established by a gift from Dr. Harriet Benson to help further the careers of talented young female scientists. 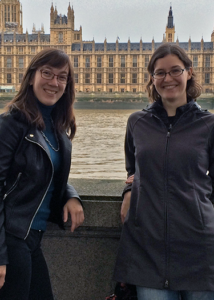 2016 Harriet Benson Fellows: Katie (left) and Suzanne (right).